The Wilkes-Barre/Scranton Penguins are playing the waiting game after sweeping the higher seeded Providence Bruins in Round 1. The earliest that they will begin the Atlantic Division Finals is Wednesday, May 4. That is a week-and-a-half layoff between playoff hockey games, which one can imagine might make it tough for a team to maintain the level of intensity that comes with playoff hockey. The Pens have gone from 3 straight thrilling OT victories, to scrimmaging each other, and playing games of dodge-ball in their free time to stay competitive. Clark Donatelli has split his roster into two groups; White vs. Black. They are competing in various competitions on and off the ice to keep the juices flowing. The time off can certainly be a good thing to allow injured players like Sahir Gill and Reid McNeill to recover from injuries that have kept them from playing. We won't know for a few days yet whether this time has been beneficial or harmful to the Penguins, but Donatelli's approach is certainly proactive, and it would seem to be a great concept to keep him team focused on one thing, winning. DeSmith makes a save against BU. During the Penguins' first round series, there was a common question asked of Head Coach Clark Donatelli; Who will be in the Net? Donatelli was never willing to commit, or show his hand to Providence, but Casey DeSmith led the team onto the ice for all 3 games of the first round sweep. Tristan Jarry, who played the backup role for the series, is a highly rated prospect and clearly a large part of the organization's future goaltending plans. There is no doubt that Donatelli and the Penguins' management team have a tough decision to make regarding the goalie situation in WBS. Either they play Jarry who has been the number one goalie since Matt Murray's recall. Or they go with the hot hand in DeSmith, who is on a PTO with the Pens after spending the majority of the season as Wheeling's number 3 goalie. DeSmith was the first round hero, but Jarry could surely benefit from getting some playoff experience of his own. Obviously none of us have any say in who the team will go with, but I'm going to make the argument for sticking with Casey DeSmith for now, and signing him to an AHL contract for next season. It should come as no surprise to anyone that Casey DeSmith was able to handle the pressure of being a rookie goaltender in his first professional playoff series. The adversity that he has overcome outside of hockey, makes stopping a little rubber puck in a sudden-death OT period like flying a kite. DeSmith was settling into his off campus house for what was sure to be a promising senior season. 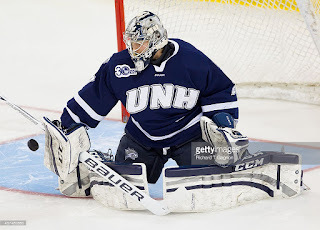 He was already the starting Goalie at UNH for 3 years, earning the job as a freshman and excelling at the position. He was a highly rated prospect and undoubtedly had a bright future ahead of himself. His numbers through his first three seasons were very good as he posted a 2.32 Goals Against Average, and a .923 Save Percentage. 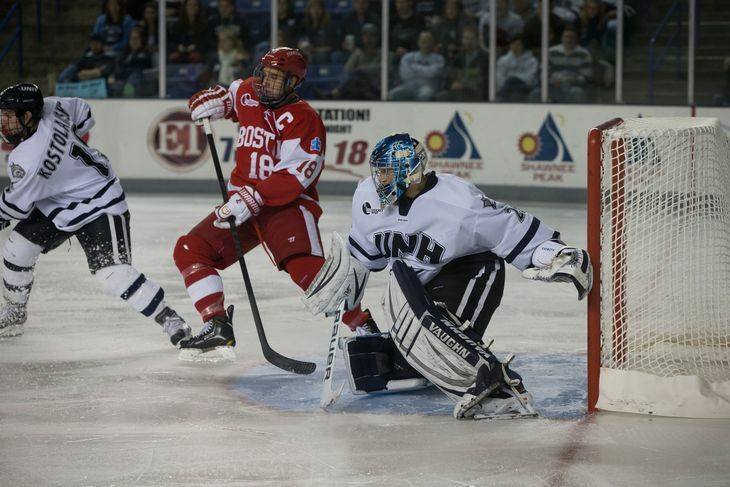 During his sophomore season his outstanding play helped lead UNH to the second round of the NCAA Tournament, just one win away from The Frozen Four. 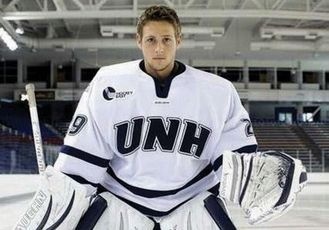 Little did he know, all of that was about to change, and he would never play another game for UNH or any other Collegiate Hockey Program. In the early morning hours of August 31st, 2014 police responded to an incident allegedly involving DeSmith and his girlfriend. The police report from that morning states that his girlfriend had been thrown to the ground, jumped on top of, and repeatedly punched and spat upon. Casey was charged with One Count of Simple Assault and One Count of Resisting Arrest. 3 days later he was suspended indefinitely from the hockey team. Eventually on Nov. 17th of that year, it was reported that DeSmith was no longer enrolled at the University of New Hampshire. It should be noted that he had a career GPA of 3.3, clearly he took his studies seriously making the blow that much harder on him. Later on that November, a disciplinary board met to discuss what course of action it would take regarding the incident. The board would eventually rule that DeSmith was innocent of all charges, and that he had caused absolutely no physical harm to anyone involved. The board stated, that original imcriminating statements against DeSmith were inconsistent. Also that eye-witness reports indicated that DeSmith did not act out in a physical way whatsoever. Other evidence led to the decision as well but was not revealed. The Police would also drop all charges against the Goalie, but did add one count of Disorderly Conduct which is below a misdemeanor offense. UNH did allow DeSmith to re-enroll at the University but the hockey team wasn't willing to bring the Senior back, as they had already taken care of the vacant position in the net. Surely DeSmith was relieved to be cleared of the criminal charges, and to maintain what had always been a sparkling reputation, but the hardships weren't over just yet. “Most people, myself included, felt as though it would be an easy decision for the NCAA to grant this waiver,” he said. “However, continuing the trend of the previous months, people who do not know me or my situation had no problem declining my waiver, effectively killing any possibility of my finishing my education at this time. Declining my waiver did not help anyone and only hurt me, my family, and the schools I could have attended.” Like with many high profile incidents, pretty much everything that was first said about the incident turned out to be completely false and/or inaccurate. On July 30th of last summer, Casey DeSmith could finally start to put the past behind him. He signed his first professional contract with the Wheeling Nailers. He was quoted by Mike McMahon again: “Despite all of these obstacles and challenges, I have stayed positive and have done my very best to overcome them,” DeSmith said. “I’m very much looking forward to moving on to the next step in my hockey career, and can’t wait for the season to start with Wheeling.” Through everything this young man maintained his class and character, despite the life he had always dreamed of nearly being ripped away from him. We all make mistakes, and I'm sure Casey would admit to making mistakes on that night, but he has been proven innocent of doing anything criminal. He has been one of the nicest, and most pleasant players I have ever had the pleasure of talking to here in Wilkes-Barre. It is my sincere hope that Clark Donatelli continues to call on him, and he is able to continue having success and writing a positive ending to his story. With all that he has been through, one thing is certain, a little adversity won't keep him down. What more can you ask for in a Goaltender? Thanks for Reading and don't hesitate to leave a comment here or on Twitter @jfoo1654.